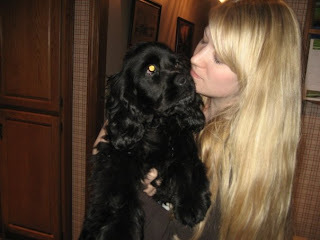 I have been obsessing...and I mean REALLY obsessing about getting a dog for a couple months now. I decided I wanted to adopt a dog instead of buying a puppy because I felt that there were enough dogs that needed a good home. My day would begin and end with me searching the internet for the perfect companion. I would start by checking the Oregon Humane Society, Craigslist, Multnomah Animal Control, the Oregonian and The Willamette Week classified ads. One day I was so stressed out that I took the bus to the humane society and fell in love with this Brittany Spaniel/mix at the Humane society. She was a year and a half and house broken. She was brought in because the family had a baby and the dog was not getting along. What appealed to me the most about her is that she looked like a big dog but was only 30lbs. I lost her. I didn't have an apartment or anywhere to keep her. I love big dogs and have no interest in small dogs. 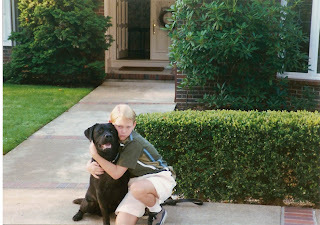 I was raised with two labs, Maggie (a yellow lab) and her son Pierre (a black lab). We got Maggie as an incentive to move to Oregon. 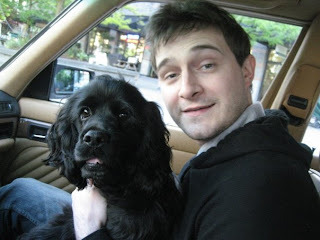 My parents promised that we could get a dog when we moved from L.A. to Portland, Oregon (where it snowed...something else we were very excited about. ) We picked up Maggie from a breeder in Bend and she traveled the whole way home asleep on my lap. She was my sister. A few years later we decided to breed her and she produced a litter of 5, one of which was Pierre, who we kept. Her son Pierre was beautiful and perfect from the beginning. 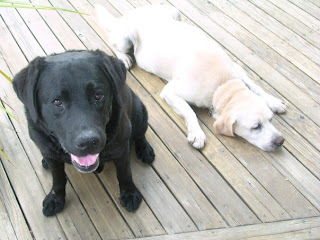 He was the blocky headed black lab who was my brother's since Maggie was mine, but in reality both dogs were really my father's. 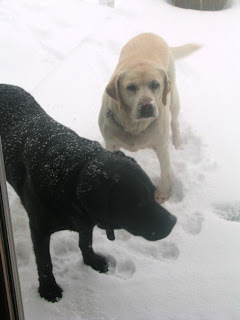 Last year, Maggie was put down and Pierre passed away right behind her. It broke my heart because he was so sudden. All of this colored my decision not to get a lab; it would be too hard. Next I decided Cavalier King Charles were the dog for me because they had the personality of a retriever but were small dogs, breed to be lap dogs. I had to get over my snobbery of small dogs because apartments and my lifestyle required them to be no bigger than 30lbs. I loved that they were not hard-wired to hunt or heard or anything like that. These dogs are expensive and have a long list of health problems. All breeds are prone to certain health problems, but this one takes the cake. So then I decided, I would just leave it up to fate. I wouldn't focus on a certain breed or hybrid I would just wait for a dog to say, I'm yours. Well, it happened. And it happened a little sooner than I expected. 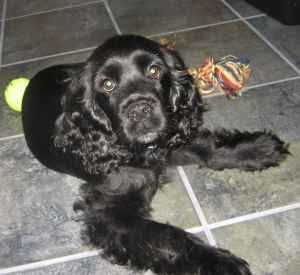 I was looking at craigslist and I saw this ad for a cocker spaniel. I hadn't thought much about cocker spaniels and everything anyone had told me was bad, so I was hesitant. But I took one look at this picture and new I had to get this dog. So I contacted the family to ask them why they would give away such a beautiful dog. The mother said that she didn't realize how much her husband didn't like dogs and was sad that the dog had to spend it's life outside. They didn't feel that it was fair and that he would be much better suited to be an indoor dog. Perfect. I would love an indoor dog and he has already been socialized by a family. Things were looking up. But then things were looking down...because I didn't have an apartment and he was too young to bring to work right away. So I dropped the idea. But I kept dreaming about him and about our life together. These dreams were so vivid that I thought he was actually mine. A day later at work, a friend convinced me to go out to see the dog. Then another co-work joined the conversation and told me I had to at least meet him. I had to know what he was really like. Well we all know how this story ends. I fall in love. He loves me, I love him...it's happily ever after. But not quite...cause I still didn't have an apartment and my parents weren't being supportive. I stuck with it and finally found a solution: We would live with my parents at their house (they totally came around) and then move into my apartment June 1st. Victory! I picked him up on Tuesday. I was nervous and scared to be a dog mommy, but we bonded so well and he is such a little gentleman. He continues to surprise me with how lovely he is. He is just happy to be with me. And he's pretty smart too! He is going to be such a mamma's boy...It surprises me how much I love this dog and that makes me pretty happy. What a handsome boy! You can tell he's a sweetheart just from the photo. Congratulations to both of you!